In the current economy, there are millions of people looking for work, and designers and developers are no exception. Some people are looking for full-time employment and others for freelance opportunities, but whatever the case may be, industry-specific job boards can be a great source for opportunities. The design and development industry has a number of excellent job boards, and thousands of people take advantage of them each day. However, for many people, the time is not always available to browse through job boards on a regular basis. This is where RSS feeds can be an excellent tool for keeping an eye out for work without the time commitment of job board browsing. You can quickly scan through new listings and get notifications from multiple job boards in one place. Additionally, with RSS feeds you can be aware of positions shortly after they are posted and act faster than you probably would be able to otherwise. 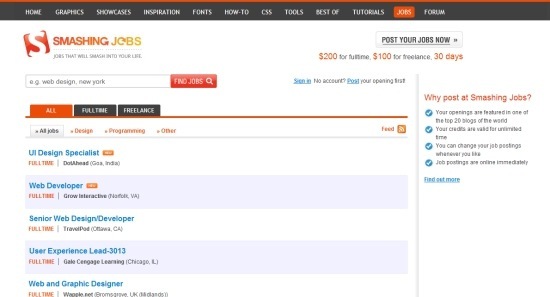 Cameron Moll’s Authentic Jobs is probably the most well-known job board specifically for designers and developers. It includes full-time and freelance opportunities in the categories of interaction design, graphic design, development, mobile, and management. On average, a few new jobs are posted each day. 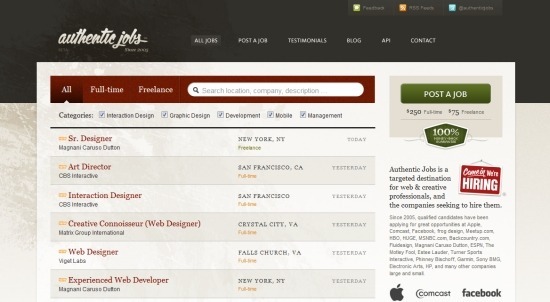 Coroflot has one of the largest and most active job boards for designers. Categories include web design, graphic design, fashion design, architecture, advertising, and several others, primarily for full-time positions. It also includes an employer directory where you can browse through current listings by employer. 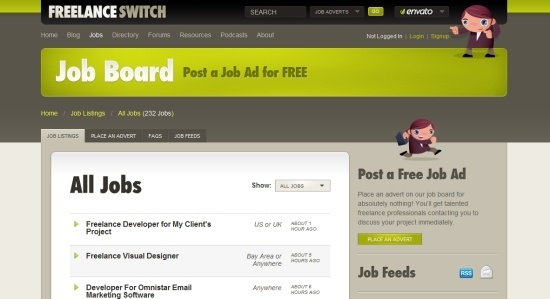 For freelance opportunities, the Freelance Switch Job Board is an excellent place to find work. There are a lot of opportunities posted, partly because it is free for anyone to create a job listing (freelancers pay $7 per month to have access to apply for jobs). Categories include design, development, illustration, Flash, writing, and miscellaneous. 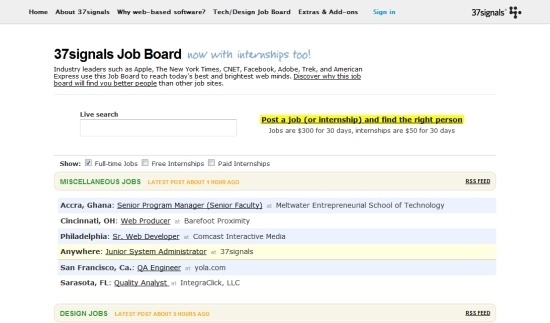 Krop is another large, active job board that specializes in creative and tech jobs. As a job searcher you can create an account and save jobs to your favorites and add private notes. You can also create your own portfolio and resume page on the site. 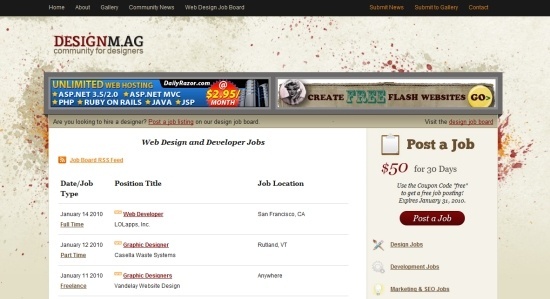 The job board at 37signals is a great place to find design and development jobs. It is more focused on development and programming positions as compared to some of the others mentioned so far that have a heavier concentration of design jobs. It includes full-time positions as well as paid and free internships. 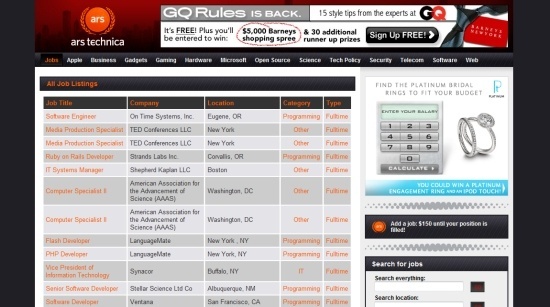 The Ars Technica job board is a great place to find development, programming, and IT jobs. There are also some design jobs posted as well, but they are in the minority. Most of the listings here are for full-time employment. 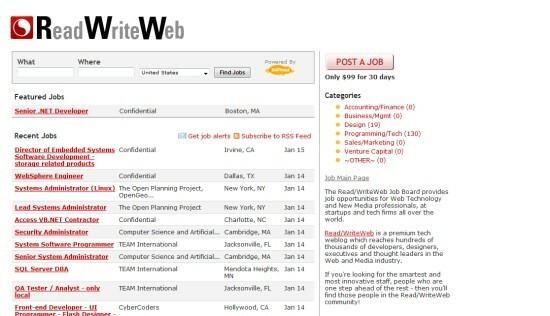 ReadWriteWeb also has an active job board that focuses on development and programming positions, but there is a smaller selection of design jobs as well. It includes mostly full-time positions, although there is no separate listing type for freelance vs. full-time. The DesignM.ag Job Board (full disclosure: this is my own job board) has a majority of opportunities in the design category, with a smaller selection of development jobs. It includes full-time and freelance opportunities with some part-time jobs also in the mix. The extremely popular design blog Smashing Magazine also has its own job board for design and programming work, as well as an “other” category. It includes both full-time and freelance opportunities and seems to have more jobs outside of the U.S. than many of the other job boards. Web Designer Wall also has a job board, Design Jobs on the Wall. It presents primarily design jobs with some coding opportunities posted as well. 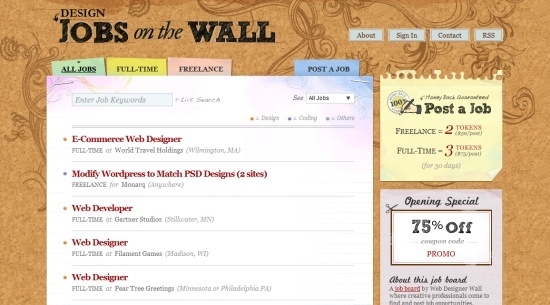 Design Jobs on the Wall provides full-time jobs and freelance work possibilities. 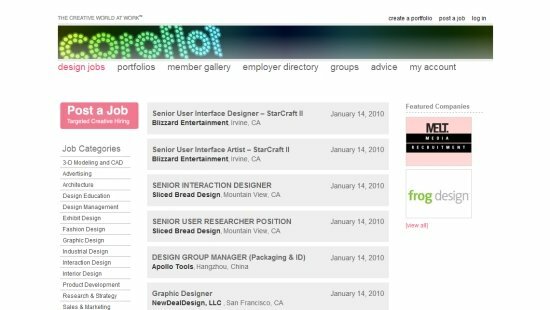 If you’d like to find design or development work, these 10 job boards can all be excellent sources. For those who would like to keep an eye out for opportunities on an on-going basis, subscribing to RSS feeds can make your life much easier. You can visit any of these sites and pick up the feeds individually, or download the OPML file, import it into your feed reader and subscribe to all of them. Download the OPML file and save it somewhere on your computer. Click on “manage subscriptions,” which is located below the feeds you are subscribed to. Click on “Browse” and find the OPML file on your computer. Then click on “Upload”.